Great new vacation rental on the Southridge of Flamingo with spectacular panoramic ocean views! This villa is located just above Flamingo Beach known for its beautiful white sands and designated as a 'blue flag' ecological beach. Luxurious natural surroundings are outside your window and within walking distance from your door. Spend time relaxing and respecting this natural paradise, an ideal setting that makes for the perfect portal of tranquility for people on honeymoons or family fun. This brand new villa has three large bedrooms (each with its own ocean view, private bathroom, air conditioning and ceiling fans). 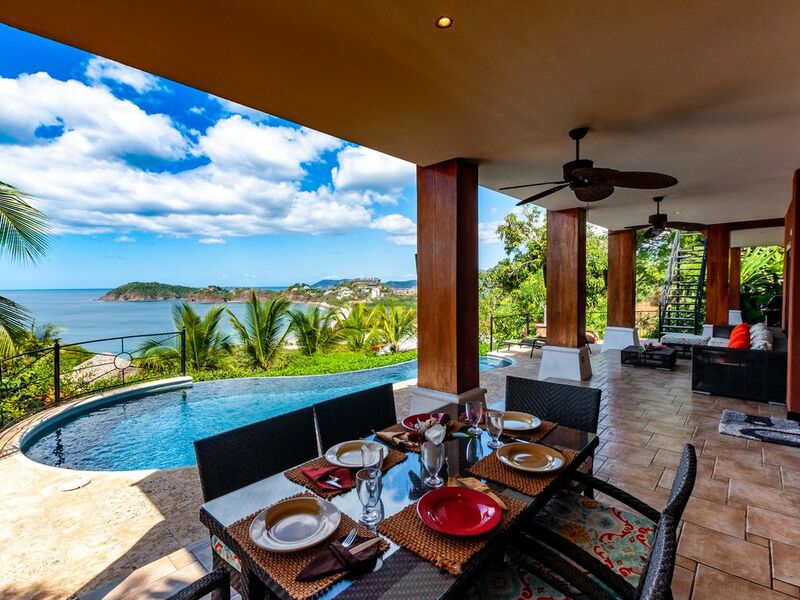 The villa can accommodate 6-8 people. The master suite has a king bed, while the other two suites have queen beds. Two bedrooms are on the second floor with balconies, while the third bedroom walks out to the main patio/pool area on the main floor. Things To Do: There are lots of options. Conditions are ideal for boating, sailing, fishing, swimming, snorkeling and beach combing - or hiking, biking, 4-wheeling, birding and exploring - or, if you prefer, shopping, or simply reading and relaxing. the ocean beaches, protected by an extensive offshore reef, are among the finest anywhere. It is a world of sparkling blue water, with privacy and tranquility, a place people return to year after year for relaxation and renewal. Playa Flamingo is prized by all the Travel Guides, with good paved roads now all the way to Liberia and San Jose. You can reach many of the best national parks in Costa Rica within a 2-3 hour drive. The average annual temperature hovers around 82 F or 28 C.
This was our second time staying at this property, and just like last year - it was spectacular! The house is very comfortable and fully equipped. Spent many hours on the covered patio enjoying the view. Many restaurants available with a short golf cart drive. Can't wait to come back! Pura Vida! The property was a 10! Perfect for 3 couples, very private bedrooms and clean individual bathrooms. Property was very clean and well maintained. We would definitely recommend this property!! The road to get to property, as it’s on top of a very large hill, is uncomfortable to drive. We rented golf carts that were far better than being in a vehicle. Perfect for a small group. spectacular view. This house has a fabulous view. Spectacular sunsets! We came during the green season, which can mean a lot of rain. We lucked out and had beautiful weather. The housekeeper that lives in the casita was on vacation, but the Rosa who took her place this week was great. We loved her! We had groceries brought in early just in case we had an unexpected travel delay. It was nice to be able to have a snack and cervesa upon arriving and breakfast the next morning, before a making a trip to the grocery. We booked all our excursions through Jonas at Aventours-costa rica. He made sure we were perfectly matched with a guide and trip for my family, which was a adventurous 22 year old boy and a hubby, who was still cautiously moving from two hip replacement surgeries this year. We went to waterfalls, road atv's and they drove us to and from the airport. We used Economy car rental in the city of Playa Flamingo. My second time using them and I really like them. much better experience than the airport car rentals. Great food and sunsets at Coco Loco just down the street on the Beach. Also loved Maries a little further down. Beach massages were great. Overall, it was a great trip and experience. Beautiful home with fabulous views! This is a beautiful and well-kept home in Playa Flamingo, with gorgeous views. We loved the infinity pool and beautiful deck. The house is short walk to the beach, 5-10 minutes (all uphill when you return). We did not rent a car and found that very little is within walking distance but we were connected with local drivers that were able to transport us around. We loved Fresia, who oversees the house and stays in the casita in back. She was a wonderful resource and so helpful to us. We also found that working with Special Places of Costa Rica made everything very easy and they were a pleasure to work with. We took advantage of their concierge services and had the house pre-stocked with groceries, rented a cell phone and had several excursions set up for us. We highly recommend Casa Flamingo, Fresia and Special Places! House was immaculate! There was a roof top wet bar that we were not aware of! It was great for sunset. Area was great . Costa Rica was great! To sum it up the whole experience was great , house and all , the pool was awsime by the way! Very nice house, very nice vew. enjoyed the pool, the monkeys were fabulous, beaches around very nice. Edgar the guy who takes care of the house is super helpfull and very nice. thank you Edgar. Flamingo is located about 1 hour from the Liberia International Airport, or 20 minutes from the Tamarindo regional airport. The roads were all recently redone and are safe for driving! Flamingo is in the Guanacaste region on the northwest Pacific Coast and is a popular area for tourist and also US/Canadian residents. CHECK-IN TIME IS 2 PM CST. CHECKOUT IS 11 AM CST. Alternate times may be accommodated based on scheduling. NO Early Check-in or late Check-out unless confirmed by Special Places in writing via email. CANCELLATIONS – 50% is due at the time of booking and the balance is due 30 days prior to arrival. In the event that you need to cancel your rental less than 60 days prior to your arrival we are happy to offer a credit to stay at the same property within one year. If you cancel more than 60 days prior to your arrival and we are able to re-book the property, we will refund you the deposit minus a $100 processing fee and credit card fees. This does not include holiday rentals. No refund or credit is given for holiday rentals. We recommend purchasing inexpensive travel insurance in case of last-minute cancellations.